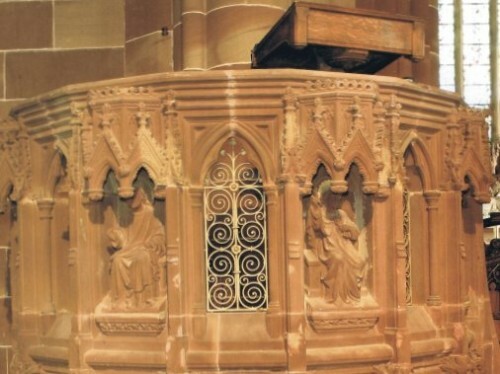 St Martin in the Bull Ring » Stewart’s Blog – Is anyone listening? Stewart’s Blog – Is anyone listening? I love preaching. When I say that what I mean is that I love doing the preaching thing. Now some of that is because I like to perform (it’s the actor in me or the desire to be a stand up comic or just being the focus of attention) but hopefully not too much. Some of it is because I want to communicate the amazing story of Jesus Christ and how the gospel can transform everything. And some of it is because I believe in the scriptures. We have such a treasure for all of life in the bible that someone needs to open this treasure up and share it with everyone. I love trying to do that. I also love hearing others do it. In the dim and distant past when I was first let loose on a parish as the vicar I sat in a meeting with fellow clergy and we discussed preaching. (We usually talked about funerals but for some wonderful reason which I no longer remember we talked about preaching.) One senior colleague stated that as far as he was concerned preaching was dead. It was pointless because people couldn’t sit and listen to one person talk to them for more than 10 minutes so keep it short at worst and even better don’t speak at all. The point I made then and still believe now is that dead preaching is dead not preaching. If you deliver a dull, irrelevant and boring sermon or sermonette then that’s how people will respond. And probably only once or twice because who wants to sit in a cold church and be bored when you can do the same at home and in more comfort. These past three months have been a chance for me to spend time reflecting on preaching. It has been the focus of my sabbatical. I have listened to a number of preachers both in the UK and in the USA. It has been good for me to be on the receiving end as it were and rediscover what people have to encounter week by week. Initial thoughts on what I have heard? 1. Good preaching still grabs people. 2. You can preach to the committed Christian (edification) and the non believer (evangelism) at the same time. 3. The bible is always the best place to start. 4. You don’t need lots of jokes to get attention. 5. You do need passion. None of these are I suspect particularly earth shattering in terms of insights but for me they are useful reminders. If I want people to listen to me then these are some of the things I need to put into practice either for the first time or again and again. Rev Canon Stewart Jones, Rector. I am a scot who has been ordained for 24 years. I have been the Rector at St Martin in the Bull Ring for 7 years. Prior to moving to Birmingham I was in Canterbury, Kent where I served as Archbishop’s chaplain for 6 years as well as working in a parish. I am married to Julie and we have three children; Naomi, Sandy and Jess. I enjoy sport (watching only! ); films and reading. I am trying to learn about gardening but am better at making mistakes than actually growing anything. If I look at your 5 key points Stewart, I can only reaffirm that you provide all of the above, and that we are fortunate that you share so much of yourself with us. Were I to emphasise a single point, it would be passion, and you are passionate not only in your preaching but in all you do, about God, St Martin’s, the wider Church, and the relationships that you build.